Sometimes I just have to look back at where I started and congratulate myself on upping my level of fabulousness. In honor of Throwback Thursday and to take a break from 18th century, I give you the Cranach Gown. 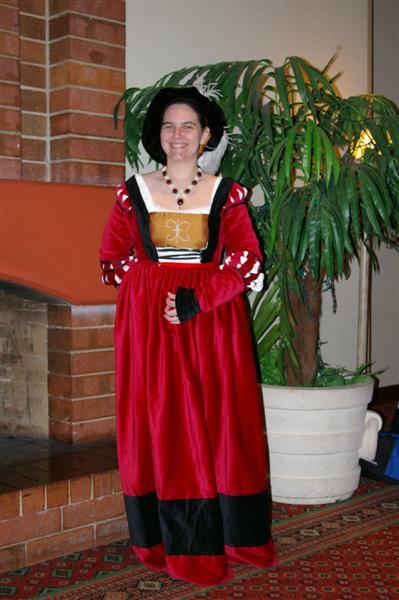 Fun fact: my urge to start costuming started with attending the renn faire. My mom made my sister and I matching outfits in 1998, but I had gradually begun to realize that they were terribly farby. An upgrade to leather stays did not help at all, and the "wench" outfit I wore when I worked the faire was not accurate either. I felt this was unacceptable. Enter my husband and his obsession with German history. He introduced me to the idea of landsknechts in 2004 and from there I naturally progressed to Cranach. I had to have one! 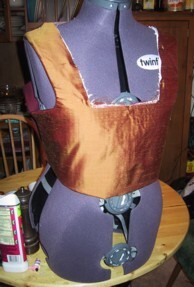 Keep in mind I had only been sewing for two years and had only made like three things total. Believe it or not, this was the dress I was most proud of for the longest time. It was made of 100% cotton velvet and 100% silk dupioni, which I thought was the height of authenticity. 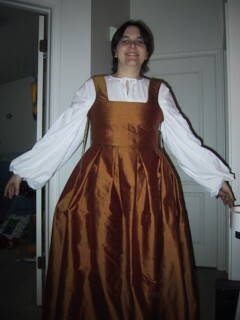 I made a freaking kirtle to be worn under the dress, which I then ended up not using because of fit reasons. A+ for effort though. 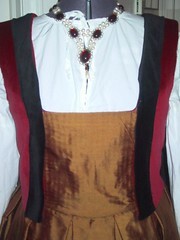 The kirtle was a shot red/gold dupioni over a duck cloth base that I "boned" with hemp. It was about as supportive as you might think. Oh look! Commercial bias trim. But only around the neckline. The rest is, wait for it, bag lined! 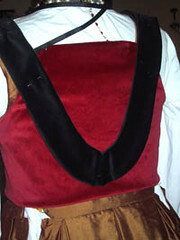 The bodice before the skirt was attached. 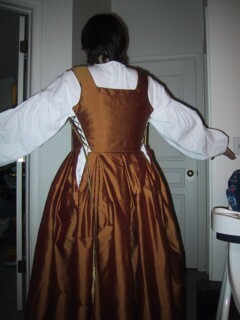 I'm 99% certain that I sewed in lacing rings to close the kirtle, but since it no longer exists I can't be sure. I used the heaviest duck cloth I could find to make the kirtle because I thought it would be more supportive or something. It actually just resulted in a gnarly wrinkle under the bust and a general ill-fitted look. I threw up my hands and moved on. I still needed some sort of support garment so I made a hemp boned set of stays out of a poly/linen blend. I did not have a pattern or any real documentation. Honestly, I pretty much said to myself, "This might work!" and rolled with it. No photographic evidence exists because they were gross. 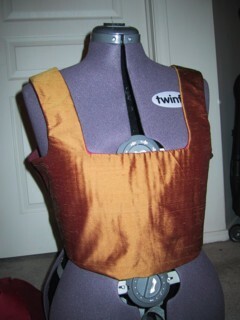 So on to the bodice of the main gown! 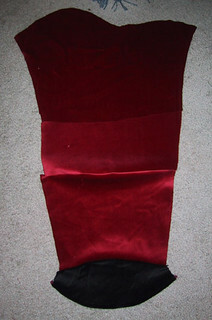 Since I was a little baby costumer, I thought that sewing velvet with a machine was the best plan ever so the black guards are all sorts of funky. I actually re-did them once - the picture on the left below is the first try and the other two are the final version. 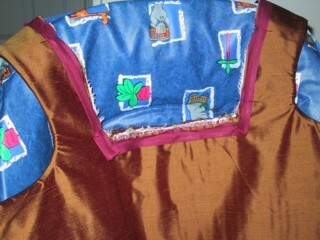 The bodice pieces are bag lined because I didn't know any better. Also, I loved bag lining. This also had little rings sewn in for the lacing. 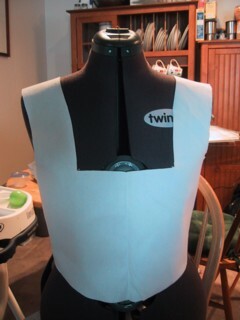 For the sleeves, I stole the sleeve pattern from some random commercial pattern, cut some slashes, and prayed. 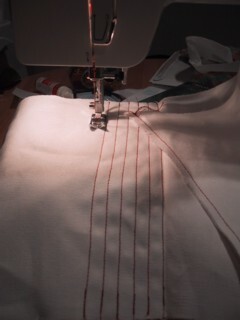 A lot of my sewing process involves blind faith and praying. Some things never change ;) Anyway, I only attached the sleeves at the top of the shoulder because they didn't actually fit into the armscye. There are worse pictures of me on the internet. 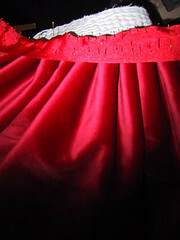 The skirt is cartridge pleated to a polyester grosgrain ribbon, again because of reasons. Honestly, this dress was such a trainwreck. I was so darn proud of that pleating. So, the initial try-on went like this and I was so pleased. It looked like a dress! Hurray! Look at the pride in my expression. Don't look at the polyester ribbon waistband. Wow. And the accessorized final result. 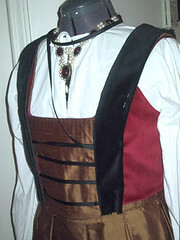 This was from its second wearing at Costume Con in 2005. I thought I looked amazing. I don't even know what that pearl design is. Maybe a fleur de lyse? Who even cares? It doesn't exist anymore. So there you have it. One of the very first historical projects I ever worked on. 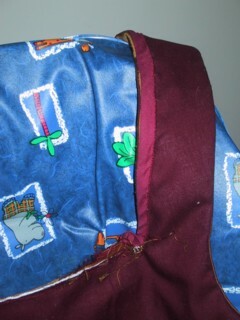 It doesn't fit well and some of my construction choices were dubious at best (polyester grosgrain ribbon? Seriously, Sara? ), but the overall presentation isn't 100% terrible. The dress lives at school and my students enjoy using it to act out Macbeth. I have far more embarrassing skeletons in my costume closet. 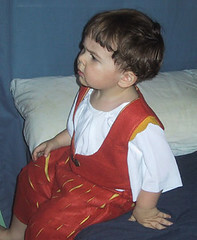 Bonus: The little wool felt landsknecht outfit I made for my then two-year-old son. This was the only time he ever wore it since he refused to put it on for the renn faire.